From december 2017 to febuary 2018, Noémie Brancard have met 11 artists and artists collectives in Belleville. The photographer invite us in the studio, close to the artworks to come, among a varied assortment of colors and materials, encountering the artists and their intentions. Come with your art tools ! 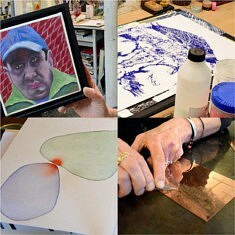 Once a month, we can draw together, experiment techniques… it’s not an art course but a free workshop.